As the largest U.S. rescue airlift since Hurricane Katrina continued along the northern Front Range of Colorado, more rainfall in the flood-weary city of Boulder pushed it to a new milestone on Monday, with 2013 going into the record books as the city’s wettest year — with three and a half months still remaining. 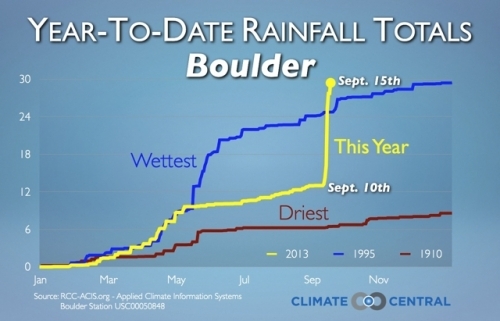 So much rain fell since Sept. 9 that Boulder, Colo., went from having one of its driest years on record to its wettest. With 30.14 inches of rain and counting, more than half of which fell since Sept. 9, the city has already eclipsed its previous mark of 29.93 inches, set in 1995. 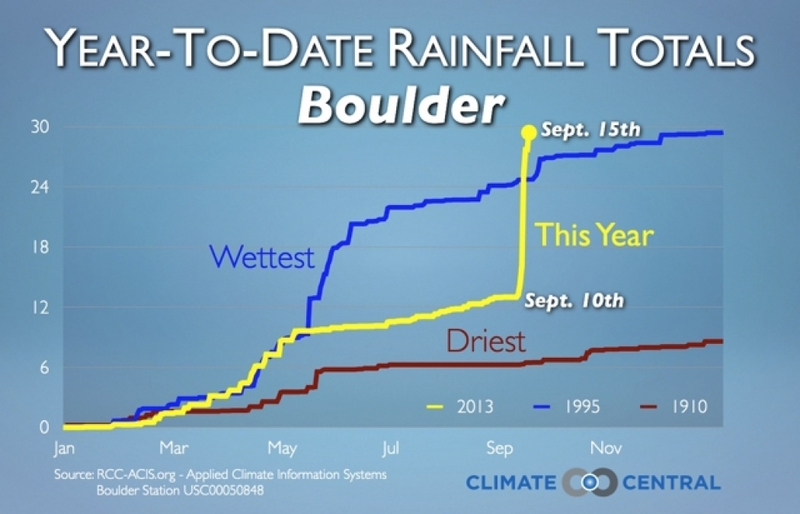 Boulder's average yearly precipitation (rain and melted frozen precipitation) is 20.68 inches. The record is especially noteworthy since before Sept. 9, Boulder, along with much of eastern Colorado, was still mired in long-term drought conditions. Five of the past 7 days set daily rainfall records. The 9.08 inches that fell on Sept. 12 was an all-time single-day record, nearly doubling the previous record of 4.80 inches set on July 31, 1919. As of 7 a.m. on Tuesday, Boulder’s monthly rainfall during September stood at 17.18 inches, all but 0.02 inches of which fell during the past week. The previous all-time monthly record was 9.59 inches in May of 1995. More than 1,000 personnel from the Colorado Air National Guard and other agencies continued to make headway locating and rescuing what are thought to be hundreds to perhaps thousands of people who have been trapped in homes that have been cut off from surrounding towns by washed out roads, bridges, and other infrastructure. The flooding is among the most widespread and extensive that the area has seen in decades or longer, with an estimated 19,000 homes damaged or destroyed, and at least 30 highway bridges taken out by floodwaters. Along the Big Thompson River, for example, the site of a deadly 1976 flash flood, the river exceeded its 1976 flood height by more than a foot, and remained above the 1976 benchmark for 24 hours, said Robert Henson, a meteorologist at the University Corporation for Atmospheric Research in Boulder. Some of the rainfall amounts that fell late last week, including the record rainfall in Boulder, qualify this event as having roughly a 0.1 percent chance of occurring in any given year, also referred to as a 1-in-1,000 year event. However, scientists cautioned that such statistical return periods are difficult to calculate given the scarcity of historical records of such massive floods and the shifting nature of probability given population growth, which has put more people and property in harms’ way. 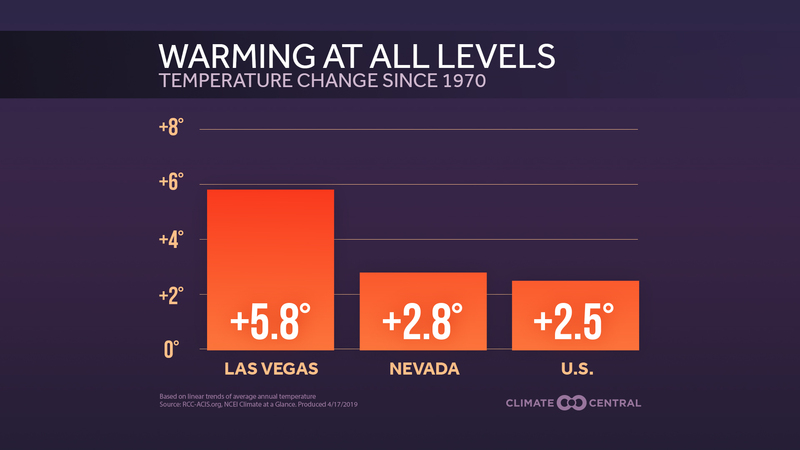 They also cited the warming climate, which has increased the risk of extreme precipitation events throughout the U.S.
“If your climate is not stationary then that adds another wrinkle (to the statistics),” Henson said in an interview. The meteorological contributors to the flood included a strong area of high pressure over southwest Canada and an upper level low pressure area over the northwestern Rockies. The flow of air around the two weather systems tapped into an extraordinary moist feed of air off the Pacific Ocean and Gulf of Mexico, transporting it northward into Colorado. Once the warm, moist air reached Colorado, it encountered a stalled frontal boundary and the Rocky Mountains, both of which caused the air to rise, cool, and condense into clouds that produced heavy rainfall. By adding moisture to the atmosphere, long-term climate change may have made flooding more likely to occur or worse than it otherwise would have been, although it will be several months until scientists can complete research that will allow them to state that with confidence. Research completed on other extreme rainfall events have shown that global warming is already tilting the odds in favor of more frequent and extreme events. 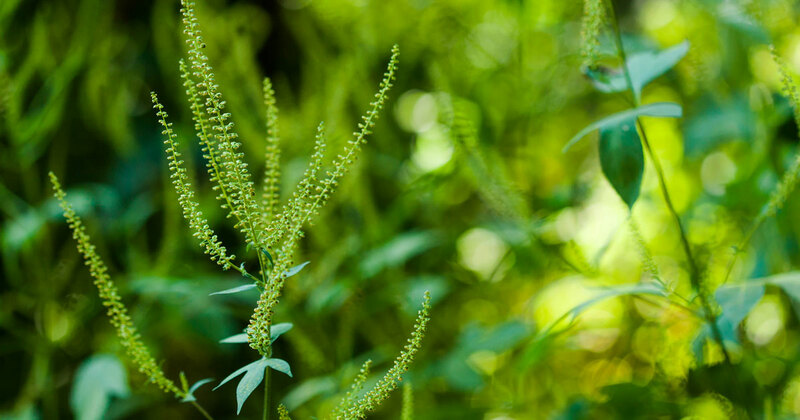 According to numerous scientific studies, extreme rainfall has become more frequent across the U.S. during the past several decades in part due to manmade global warming. Increasing air and ocean temperatures mean that the air is generally carrying more water vapor than it used to, and this moisture can be tapped by storm systems to yield rain or snow extremes. 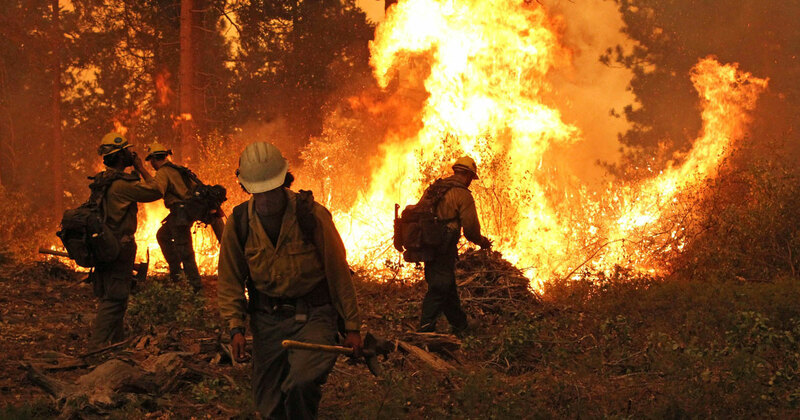 In addition, shifts in weather patterns may be contributing to an uptick in some types of extreme events, although this is an area of ongoing scientific research. Structural damage along the Big Thompson River and Highway 34, taken from a Colorado Air National Guard helicopter. Click image to enlarge. Credit: U.S. Air National Guard photo by Capt. Darin Overstreet. Trends in extreme precipitation events vary by region, and in general the biggest increases have taken place in the Midwest and Northeast. However, most parts of the U.S. have seen an increase in extreme precipitation events, according to the draft National Climate Assessment report that was released in January. Henson, a longtime resident of Boulder and the author of “The Rough Guide to Weather,” said that the air mass that led to the flooding was tropical, laden with moisture that soared to record levels for September. “The atmosphere was water-logged, with thick clouds and a tropical feel to the air. Just the experience of the texture of the atmosphere was unusual. And the rainfall amounts were stunning,” Henson said. 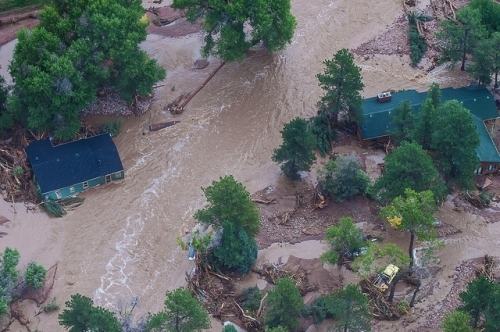 Given the history of flash flooding along the Front Range of the Rockies, residents of Boulder and other locations affected by this flood may have been aware of the risk for a major flood at some point, but this was far outside the bounds of what is considered relatively likely to occur every several decades or so, Henson said. Unlike many historical floods in Colorado, this event was widespread, affecting 15 counties in Colorado and several counties in neighboring Kansas and Wyoming. “From small scale to regional scale, this has been one for the record books,” Henson said. He said that many people whose homes and businesses experienced flooding likely did not have flood insurance because they were not located in the 100-year floodplain, and therefore not required to purchase it. “Even when you know it’s possible it’s still mind-boggling when it actually happens,” Henson said. FEMA director Craig Fugate traveled to Colorado on Monday, where his agency has been deploying teams to assist local, state, and other federal agencies in search and rescue and other operations. Did Climate Change Set the Stage for Duluth Flooding? Is Climate Change Causing the Mississippi River Flooding?